Ok, we have lots of traditions. Ever since about 1989, we’ve been staying in touch over e-mail. I’m talking about my extended family–on my Mom’s side. (The “In-Laws, Outlaws and Offspring” you may have heard of elsewhere on this site.) 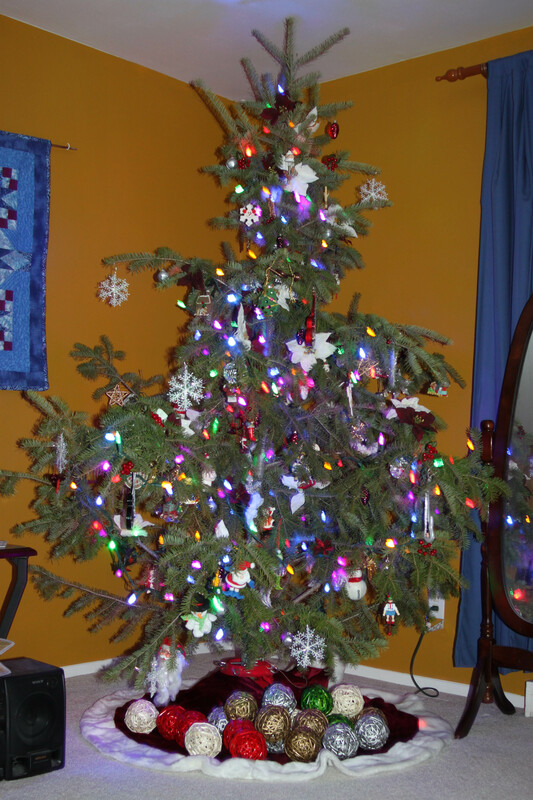 Over the last few years, we’ve sort of built a Christmas tradition where each of us sends a picture of our decorated Christmas tree to the rest of the family. This was my picture from 2010. As this was taken before my Christmas wrapping was done, there were no presents under the tree. So, in an effort to make it look a little less pathetic, I filled the space with brightly-colored wicker balls. “What ARE those things?” my family asked. I was sort of taken aback that no one knew what they were. And as I explained the heartwarming story to them, so shall I explain it to you. As you may know, one of the biggest industries in Sweden (as in other Scandinavian countries) has been sheep farming, for several centuries. Historically, it was fairly common for Swedish sheep farmers to save part of the previous spring’s wool crop for dyeing/spinning/knitting/etc. during the winter months when it was cold, so they could make sweaters and socks to keep warm, and for Christmas gifts. As you can imagine then, families in rural Swedish households often had large quantities of yarn. Because they weren’t very wealthy and lived in small houses, they didn’t have many places to store the yarn, so they incorporated it into their Christmas decorations until it could be used up on that season’s winter clothing. A couple hundred years ago, Sweden had a large outbreak of disease among its sheep farms. Flocks died off down to about 10% of their original size, and it took the sheep farming families and the industry several years to recover. During this time, they came to realize that without storing the yarn in their homes at Christmas time, their decorations seemed sparse. So, to fill the void, they would weave balls out of sticks and paint them bright colors. They would place them around the house and pray for the health of their flocks to return and their livelihoods to recover. It became Swedish tradition to decorate their homes with such balls, and they are thought to bring good fortune in the coming year if they are incorporated into Christmas decorations. I had mine under the tree just because that seemed like a good place to put them last year. This year, they may well end up on an end table.